The iPhone XR is out, at least for pre-order customers, slightly downgrading the build quality and a number of key iPhone XS specs in the name of (relative) affordability. But if you were wondering exactly what kind of under-the-hood compromises you’re looking at here, you need wonder no more. 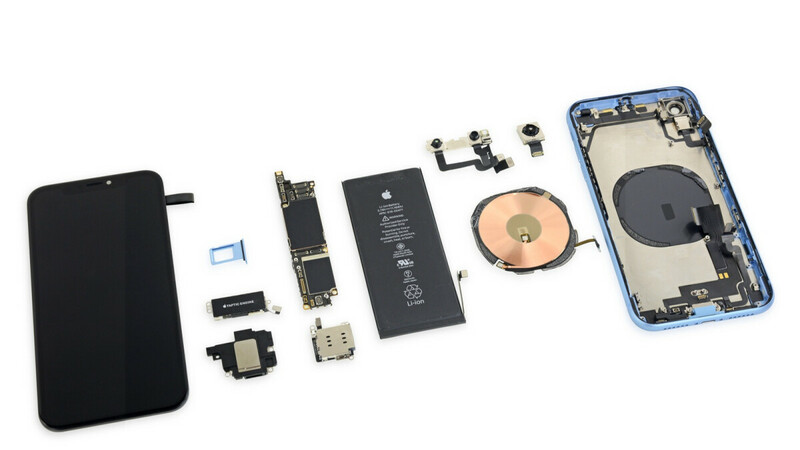 The first comprehensive iPhone XR teardown is done, courtesy of the repair specialists over at iFixit, who have unsurprisingly found Apple’s lower-cost 2018 handset to be roughly as easy to fix at home as its pricier siblings. iFixit naturally refers to display and battery replacements as the “two most common repairs”, with the technically unremovable battery offering decently straightforward access, and a single (proprietary) tool required to pop open the LCD panel. Speaking of, that LCD display assembly is described as “slightly larger” than the AMOLED equivalent of the iPhone XS and XS Max, but there are actually far more significant inside differences to note. The most interesting one is perhaps an iPhone 8-style rectangular battery for the XR (compared to L-shaped cells for the XS family). Even more intriguing is that the iPhone XR takes cues from the original iPhone X as well, namely in the rectangular shape of its single-decker logic board. All in all, you can basically view the iPhone XR as the spiritual “iPhone 9” that never happened, although its A12 Bionic chipset is just one of the many things it also has in common with the iPhone XS. As suspected a long time ago, the iPhone XR even manages to beat the XS in one essential department. Specifically, battery capacity. In fact, the 11.16 Wh iPhone XR cell is larger than the 10.28 Wh juicer of the 8 Plus as well. Granted, the screen is also bigger, but at a resolution of 1792 x 828 pixels, it’s hardly an energy drainer, suggesting truly impressive battery life for Apple’s more affordable 2018 iPhone. Its funny when most flagships android has more features than this but won’t be able to match their sales. This is for middle class who can’t afford Xs Max. buncha features dont sell a device alone, an ecosystem or previous experience does. $0 down for tennis, tennis maxx and tenor here in Canada. Even the welfare recipients can afford it. Or you know, for people who make sensible financial decisions. "Its funny when most flagships android has more features than this but won’t be able to match their sales" Wow. You're rockin Apples' mic harder than PA usually does. "This is for middle class who can’t afford Xs Max" Or for teenage iPhone users, iPhone users who don't have a need for the dual camera set up, iPhone users who don't care about a feature packed phone or iPhone users who could give a damn about an OLED display.